Workplace assessments are one of the key steps to improving ergonomics, especially when the goal is to prevent musculoskeletal disorders (MSDs). However, it is our experience that many organizations assess for conditions which are not linked to causing MSDs. For an effective assessment of exposure to MSD risk factors, the bottom line is a need to identify and address the root causes to prevent employees from developing MSD injuries. Fortunately, we know from research (NIOSH, 1997) that the three primary risk factors that cause MSDs are: high force, awkward posture, and long duration or high frequency. Increasing the combination or number of these risk factors increases the chance of employees developing discomfort, pain, and/or an MSD. The secondary risk factors that contribute to developing an MSD include soft tissue compression, low temperature, vibration, impact stress, and glove issues. Through ongoing research, the threshold of exposure to each of these risk factors has been quantified for each joint of the body. As a result, valid quantitative MSD risk assessment tools are now available based on the dose-response relationship of these injuries. This understanding of the research on thresholds, compiled by NIOSH and other organizations, provides a way to measure exposure to MSD risk factors and determine where exposures exceed an acceptable threshold, and it enables you to take proactive steps to reduce exposure before an MSD injury occurs. Not only is this metric an early warning system, but it can also provide immediate feedback on the effectiveness of controls. So measuring the level of MSD risk enables tracking, combining, and reporting the results as both systems-based and operations-based measures. 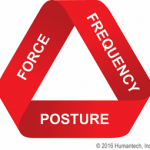 For additional information and the studies backing this, check out Humantech’s position statement on Physical Risk Factors for Musculoskeletal Disorders.